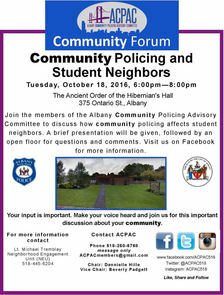 The Albany Community Policing Advisory Committee has a public meeting this Tuesday, October 18 to talk about community policing and neighborhoods in the city that have a lot of college students. Blurbage: "Join the members of the Albany Community Policing Advisory Committee to discuss how community policing affects student neighbors. A brief presentation will be given, followed by an open floor for questions and comments." If this is something you'd like to learn more about -- or say something about it -- this looks like a good opportunity to do so. The meeting is Tuesday at 6 pm at the Ancient Order of Hibernian's Hall at 375 Ontario Street. The Albany Community Policing Advisory Committee -- ACPAC -- is a group connected to the APD that's focused on building relationships and communication between police and the community.